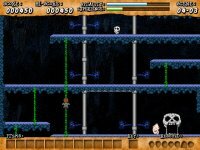 Welcome to the Brain Games remake of the 8 bit classic game 'The Goonies'. This game was made by Konami in 1986. 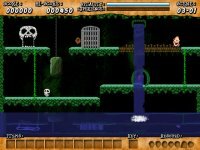 There were both a NES version and an MSX version of the game; this remake is based on the MSX version. This remake was made for the 2006 competition organized by Retro Remakes. After having participated in 2003 (with Road Fighter, which finished on the 7th place out of 83 entries), and in 2004 (with F-1 Spirit, gaining the 13th place amongst the 73 contestants), we decided to give another go at the first prize! Even though we didn't make it to the first place, we are still happy with a 5th place (out of 76)! If you have any problems, questions or suggestions about The Goonies, feel free to join us at the Braingames forums, or even better, at the Goonies forum. The forum is the place where you can find the latest developments, send us your contributions, send us fanmail or have just a friendly chat. You're welcome to join us! The action takes place in the sleepy seaside town of Cauldron Point - down in an area known as the Goon Docks. The Goonies are a group of local kids - Mikey, Brand, Mouth, Chunk and Data. One day they find an old treasure map in Mikey's attic. Data figures that this must be the fabulous hidden treasure of the notorious local pirate, One-Eyed Willy. The girls, Andy and Stef, join the other Goonies and the adventure begins. But the secret underground tunnels they are exploring are actually the hideout of the Fratelli Gang, and the Goonies are soon trapped! The Goonies have a powerful ally on their side, however, in the form of the huge and amiable Sloth. When you play this game, you are Sloth! Can you help the Goonies find the treasure and escape back to save the Goon Docks from demolition? Here you can see some screenies of the game. Ain't it nice? 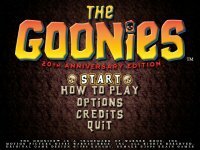 The 20th anniversary edition of The Goonies is available for Windows, Mac OS X and Linux computers. We provide binary versions for Windows, OSX and Ubuntu. For other Linux distributions or other computers you can download the source code. To run the remake, you'd need a somewhat recent computer with a decent videocard. The videocard should at least support OpenGL, otherwise it won't run. Don't use the standard Windows drivers for your card (at least if you have an Nvidia card), since the graphics will be corrupted and the game will run slow. When you have started the game, you can select the 'How to play' menu option for a visual explanation about the game's controls and objectives. There's also an explanation of the available items and what they do in the 'How to play' section. These instructions are an expanded version of the in-game menu. You can knock out the members of the Fratelli Gang, but remember: you won't gain any EXPERIENCE from this! Sloth is the main character. He's the gentle gigantic creature who helps the Goonies to find the treasure and escape from the labyrinth. These are the bad guys. They want to hunt down and capture all the Goonies, who have stumbled in on the Gang's secret hideout. They are armed and dangerous! These keys are to the cages where the Fratelli Gang has the Goonies locked up. Be careful, a cage may have more than one keyhole. Gold coins from the treasure hoard of One-Eyed Willy. Use these to increase your score. Contained in these are many devices to help save the Goonies. But, be careful: sometimes they contain something you don't want at all! Other items of treasure include... Shields, magic formulas, riddles, hyper shoes, helmets, torches, time stopping devices, and magic capes. These have different effects on the enemy, and the same item will change effects according to its color. Figure out what must be done to get these treasure items to appear!